MoL is playing a blinder at the moment with at least three excellent exhibitions: London Street Photography, Street Cries, and Hand-drawn London. All are Free. Much as I enjoyed Street Photography, I went when if first opened and it was in the school holiday, completely packed out, so I shall write about that another time. This exhibition mainly comprises about 80 illustrations of street vendors dating from the late 17C through to the late-Georgian era. The main illustrators featured are Marcellus Laroon (1648 – 1702); Paul Sandby (1731 – 1809); Thomas Rowlandson (1757 – 1827) and Francis Wheatley (1747 – 1801). Most of the images are quite small, typically 8″ x 10″, and rendered in pen and ink or engravings. Connoisseurs of historic commercial art will enjoy the skill and talent of the artists, but in the most part the appreciation and the point of the show is what it tells us socially about the street poor of London, how they dressed, what they sold (huge variety) and what people thought of them. This last point is important, because by and large, what was missing was pity. On the one hand, they are depicted as figures of fun (Sandby, Rowlandson). In contrast, Wheatley conveys his subjects as noble figures, the only difference between them and their customers being their clothes. 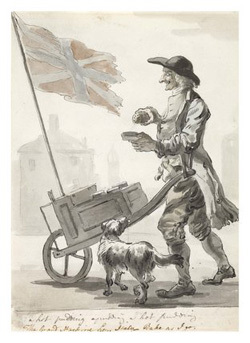 Nowhere is this more starkly demonstrated in Sandby’s cartoonic rendition of the mackerel seller (it is funny), and Wheatley’s treatment of the same subject. Most of the illustrations are captioned, often in both English and French in order to capitalise on both markets. Rare Mackarel Three a Groat or Four for Sixpence! … a stick to beat Your Wives or Dust Your Clothes! In addition to the artists mentioned, there are also some canvases, some quite large, showing more panoramic street scenes – for example a particularly good one of Covent Garden by John Collet (1725 – 1780) with excellent single vanishing point perspective. This display is in the foyer of the museum. It has been mounted in partnership with Londonist. It features 13 contemporary maps of London drawn by Londoners, some amateurs, others professional illustrators. The maps are a selection from many that have been submitted and they are all excellent. Most feature the centre of town but some contributors have focused on their own neighbourhood. What is enjoyable about them is that they are all based on very personal and individualistic ideas, which may be visual, informative, amusing or all of these things. 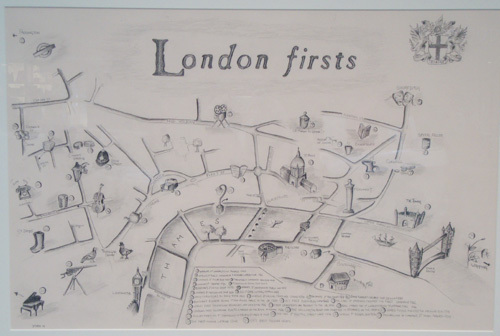 Possibly the most historical one, and hence my favourite: London Firsts by Julia Forte. The Hand-drawn London project is ongoing and Londonist encourages its readers to have a go. And I think I shall, stand aside Monsieur Rocque! 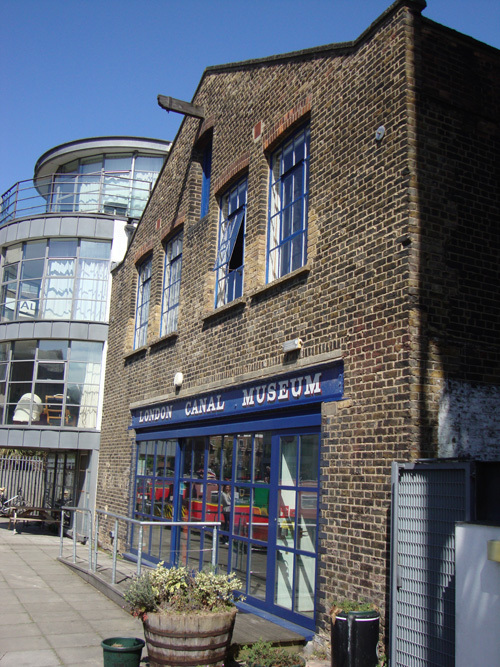 The London Canal Museum is in New Wharf Road, N1, a 10 minute walk from King’s Cross Station. The Victorian building was for many years the premises of immigrant entrepreneur Carlo Gatti, who ran the largest ice supply company in London. Many tons of ice blocks were stored in subterranean “ice wells” and distributed all around the capital by Gatti’s fleet of carts, and later, trucks. 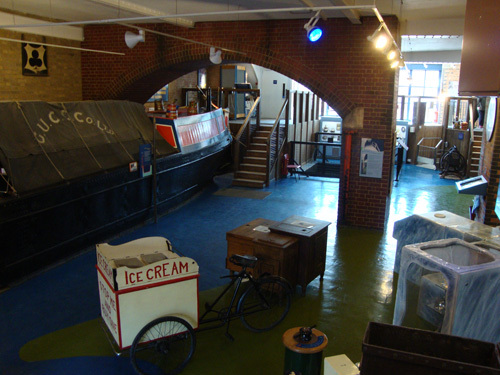 Much of the ground floor of the museum is devoted to the history of the London ice business and Gatti’s operation in particular. The remainder of the two storey building is given over to the history of England’s canals, with particular attention to the systems around London. There is a fabulous large scale map as you enter the first floor space that details all of the capital’s waterways. Various displays tell you about every aspect of the history and workings of the canal systems with very close attention to those who worked on it – bargees and their wives and children; lock-keepers; the horses. In particular the horses. 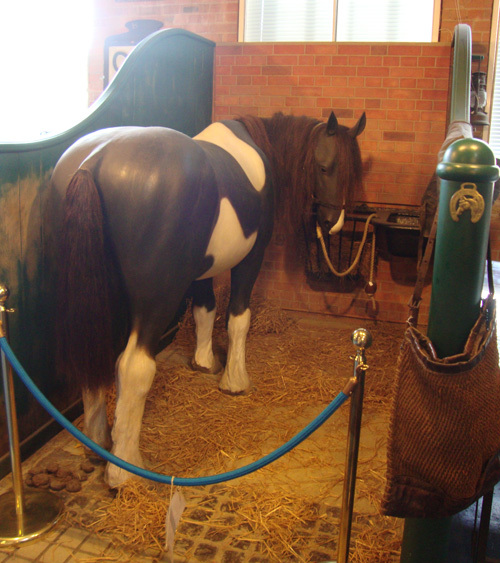 There is a fine display devoted to these beasts and all the attendant paraphernalia and support systems – stables, farriers, vet services and so on. Of particular interest – to me at any rate – is the story of the Macclesfield Bridge explosion of 2 October 1874, when the barge Tilbury, carrying a mixed load of gunpowder and petrol, ignited just as it passed under a rather fetching bridge on the Regent’s Canal near London Zoo. The bridge was utterly destroyed and needless to report, the crew perished. A most enjoyable diversion is the audio visual display which features a number of newsreel and features about the Regent’s Canal from 1924 to the late 1940s. Wonderful to see the canal-side sights of north London during these decades. The commentary on the most recent of these clips has that wonderful mildly patronising Harry Enfield-Paul Whitehouse quality about it, where the bargee’s horse is naturally called Dobbin. 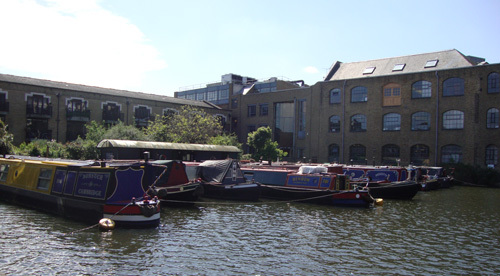 The museum backs on to the Battlebridge Basin, in former times surrounded by industrial warehouses and wharfs, but now – as with most of London’s waterways – populated by modern flats and offices. 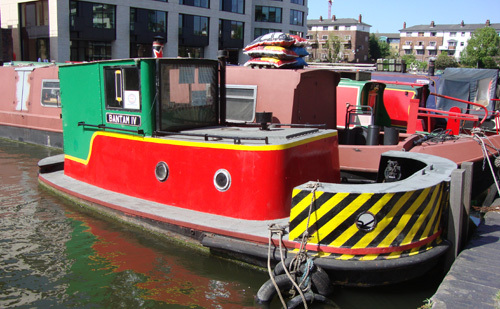 But the basin itself is populated by many barges and of special interest the museum’s own “bantam” tug from 1949-50. 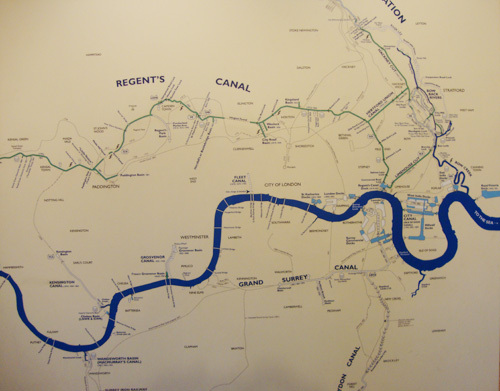 Superb wall map of London's waterways. 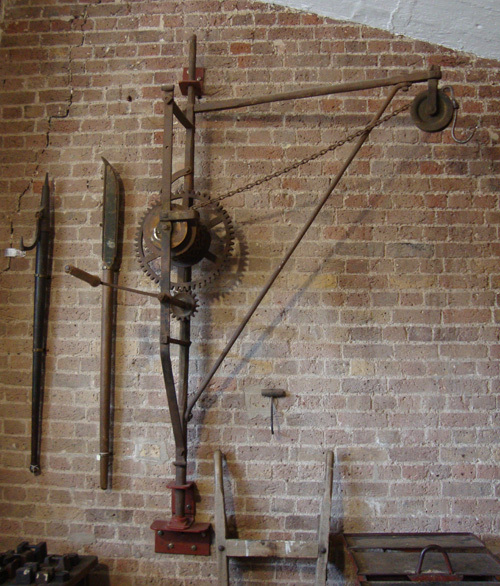 The museum features many bygone artefacts. I have mentioned elsewhere how one gets a satisfying sense of history and nostalgia from museums which celebrate industrial heritage and transportation, Kew Bridge Steam Museum and the London Transport Museum’s Acton depot being good examples. The London Canal Museum is very much one of these. It is very family-friendly with plenty to amuse the young, and I warmly recommend it. Entry is £4 adult and £2 children. The character of a nation as a people of great deeds is one, it appears to me, that should not be lost sight of. It must surely be a matter of regret when names worthy to be remembered and stories stimulating and instructive are allowed to be forgotten. It is not too much to say that the history of Her Majesty’s reign would gain a lustre were the nation to erect a monument, say, here in London, to record the names of these likely to be forgotten heroes. I cannot but believe a general response would be made to such a suggestion, and intelligent consideration and artistic power might combine to make London richer by a work that is beautiful, and our nation richer by a record that is infinitely honourable. The material prosperity of a nation is not an abiding possession; the deeds of its people are. So wrote artist, sculptor and aesthete George Frederick Watts in a letter to the Times in 1887. 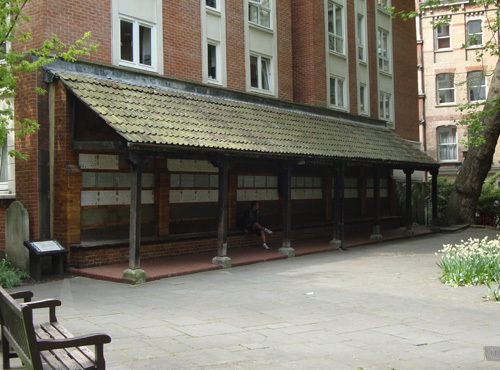 Thus the seed was sown of a project which culminated in the remarkable Memorial to Heroic Self Sacrifice in Postman’s Park. His idea was for a monument to celebrate the quiet and unsung heroism of ordinary citizens in an age when statues and memorials to grandees – both deserved and otherwise – were springing up all over the city like so many weeds. 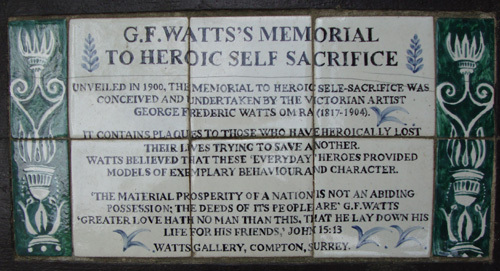 Watts’ visionary memorial was eventually opened in 1900 in Postman’s Park, a wonderfully tranquil green space which links King Edward Street and St Martin le Grand, very close to Museum of London. It is so-named because across the road is the massive former GPO building, which is today occupied by Bank of America Merrill Lynch. The park comprises bits that were formerly burial grounds for several local churches. The memorial itself is a small loggia which displays on its wall ceramic plaques, each of which is dedicated to a member of the public who died through an act of heroism. 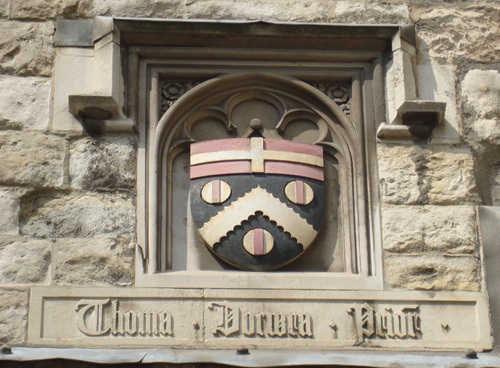 Until 2009, there had been no plaques mounted since the 1930s; let’s hope the tradition is more actively continued. The whole story of Postman’s Park and the memorial is very well covered on Wikipedia, here. The earliest and the latest heroes’ plaques. The above montage wot I made in Photoshop doesn’t tell you a great deal because of the shape of the image and restrictions of the WordPress format. But if you’d like a copy of the detailed file (about 2.5 MB), email me at admin@londonhistorians.org, and I’d be happy to send you it. 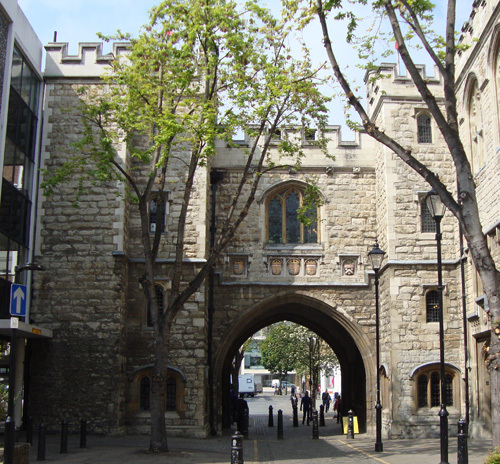 St John’s Gate was built in the first years of the 16th century by Thomas Docwra as part of St John’s Priory, the English headquarters of the Knights of St John, aka the Hospitallers. The Priory itself only survived a few more decades until it was supressed by Henry VIII, but the gate survives, although much amended by Victorian architects. 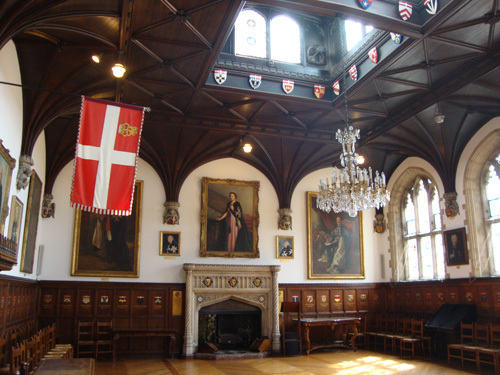 While the small museum itself is a treasure trove of St John regalia, weaponry, paintings and so on, the trick is to turn up at 11:00 or 14:30 on Tuesdays, Fridays or Saturdays to take the guided tour which is also free (a voluntary donation is appreciated). 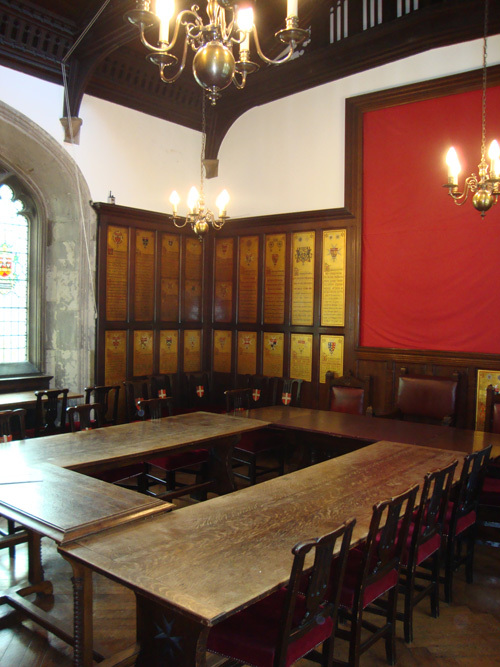 This gives you wider access to the upstairs parts of St John’s Gate and also a tour of St John’s church up the road. Today, we were shown around by the excellent Andy Rashleigh, a London Blue Badge Guide. Treat of the day for me was to sit in the Council Chamber. This room was for a time in the 18C the HQ of the Gentleman’s Magazine where Samuel Johnson was sat down and cajoled into knuckling down to meet his copy deadline. Earlier, William Hogarth’s father Richard ran a coffee house here where only Latin was allowed to be spoken. Unsurprisingly, it didn’t catch on and went bust along with Hogarth père who ended up in a debtor’s prison. 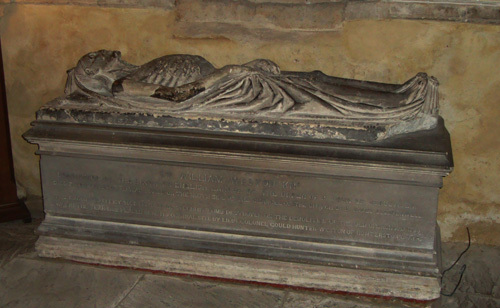 The highlight of the church nearby is the old crypt which has a rather macabre monument of William Weston, who was the last Prior before Henry VIII dissolved the Order in England. St John Clerkenwell. 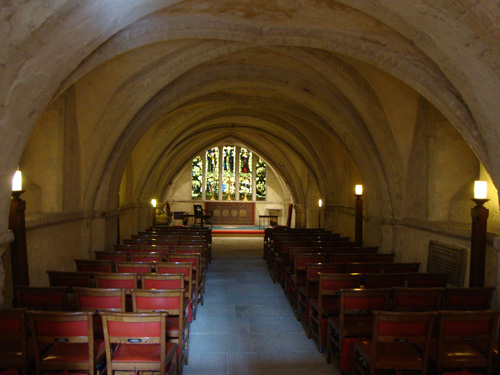 The Crypt. St John Clerkenwell. 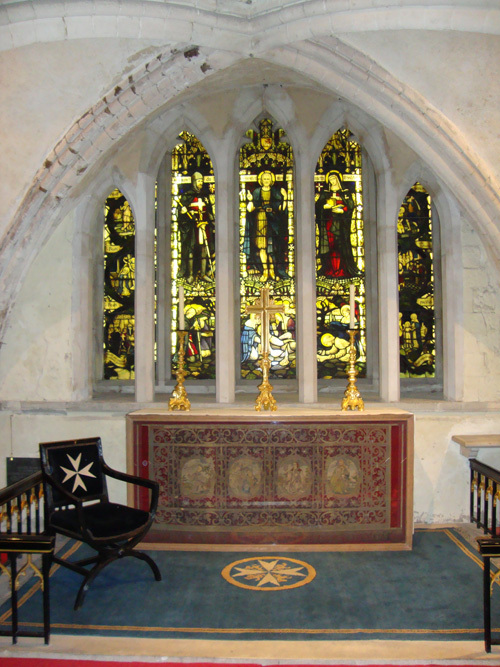 Altar in the Crypt. 020 for London doesn’t really have a ring to it. Today is the 11th anniversary of the day when 020 was foisted on us. It has been quite long-lasting compared with its hapless predecessors: 071, 081 (1990-95); 0171 and 0181 (1995-2000). But it doesn’t – can’t – do the job of the old 01, which was the capital’s worthy STD prefix from the sixties until it was absent-mindedly cast aside by British Telecom in 1990. 01 was more than just a number: it had become part of London’s brand, alongside black cabs, red buses and Big Ben. I well remember, for example, the TV programme, 01 for London. It also served the purpose of unifying all phone owners in the greater London area. Much as I would love to pick up the earpiece, crank the handle, and request: “Mayfair 52, please, operator”, I realise this is not practical. But it would be nice if we could have at least adopted 010 + 8 digits, or even better, returned to 01 + 9 digits. BT’s lack of foresight, thoughtlessness and, quite frankly, incompetence caused a lot of problems outside of my purely romantic concerns. The worst of it was the cost to businesses of changing all their stationery, livery and all the rest of it. Three times in ten years. On top of this there was the business of reprogramming all of their customer and contact data. The same thing had to be dealt with by individuals around the world in their address books, filofaxes and so on. Secondly, Londoners outside the new central zones (071, 0171) felt the perception as being second-tier by dint of being now considered outside of London. This affected businesses who valued of the cachet of being seen to be central London-based. This farce ended finally, on so-called Big Number Change 11 years ago, when we were once again united. But did it? The damage had already been done and normality will not be fully restored for many years to come, if ever. Only a minority, to this day, understands that London’s code is 020. A huge proportion of stationery and signs are rendered 0207- and 0208-. And when people tell you a London number, they tend to do this too. I always give a mental thumbs-up when I see or hear 020 (pause). This possibly makes me an old fart. There can hardly be a more fascinating dramatis personae in London’s rich story than that of the Restoration. Aside from the king himself, we have playwrights, diarists, scientists, architects, building developers, projectors, wheeler-dealers of every stripe. Everybody striving, but striving in a general atmosphere of paranoia and fear. For the issues which dominated this highly politicised, religious and violent of centuries still persisted. And so we come the legal profession, which was kept extremely busy. Dozens of barristers making a name for themselves either defending or prosecuting Catholics and recusants, in fact anyone straying from the restored Anglican orthodoxy. From Judge Jeffreys at the pinnacle wielding terrible justice to the prisoners at the bottom. On the rung barely just above them, their own gaolers and executioners. Most notorious of these was Jack Ketch (unknown – 1686). Sometimes referred to John, his surname frequently rendered as “Catch”, his onomatopoeic moniker quickly became the stuff of legend, invoked even by frustrated parents as a warning to miscreant toddlers. Even though Ketch was a public executioner almost continuously between 1666 and 1678, his background remains a mystery. Date of birth unknown, it’s thought that he came from Ireland. It is known that he lived near Grey’s Inn Road and was buried in Clerkenwell in 1686, predeceasing his wife, Katherine. With at least eight public executions a year, at Tyburn and elsewhere in the capital, it is certain that Ketch would have despatched hundreds of prisoners, almost all by hanging. Those who were found guilty of treason were also drawn and quartered at his hand. 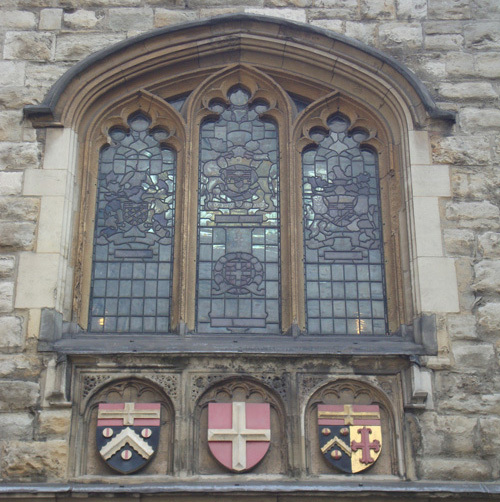 The heads of traitors, as was the custom, were displayed on London Bridge, Temple Bar and other notable landmarks. The corpses of many prisoners who were not quartered, were instead gibbeted, that is to say displayed in a cage which was hung up near busy roadways. In order to make body parts and corpses last longer, the executioner would first immerse them in boiling pitch. 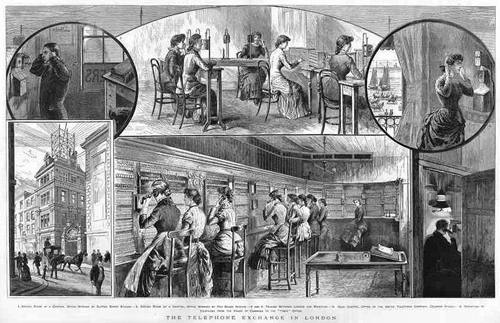 Ketch did this at his headquarters in Newgate Prison which hence became known as Jack Ketch’s Kitchen. Executioner is a macabre profession in any age, and there were many over the years, so why did Ketch become so notorious? First, there was his longevity in the job. Second, he was known to be unpleasant, and very frequently extremely drunk, on and off the job. Third, he was avaricious. 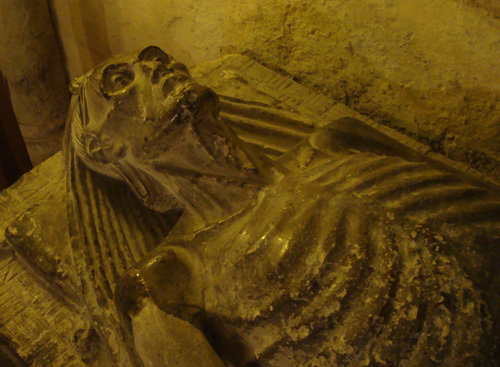 He was constantly in dispute with the authorities over payment for quartering and “boylinge” of the bodies. A further stream of revenue, it was customary for the executioner to keep the clothes of the condemned, often very fancy in the case of the wealthy, people preferred to look their best en route to the scaffold. But in addition, the prisoner would often bribe the executioner with as much as he could afford, to despatch him as painlessly and quickly as possible. Ketch was known to milk this particular system in full. One has to wonder, therefore, how he ended up doing a spell in the Marshalsea for debt. After 1678, Ketch continued to work as an executioner until his death and it’s from this period that almost certainly he derives his notoriety, in particular for his appalling incompetence in the beheadings of William, Lord Russell in 1683 for the Rye House Plot; and the Duke of Monmouth in 1685 for his failed attempt on the throne itself. 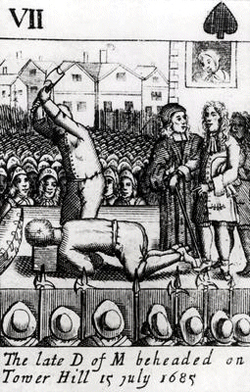 Beheadings during this period were relatively few, reserved for the high-born only. In earlier times it was customary to engage a specialist, often from the Continent, to do the job. Ketch had no experience as an axe-wielder and so he proved. In the case of Lord Russell, despite being given between ten and thirty guineas (accounts vary) to do a good job, he took at least three blows to sever the noble’s head, the first of which struck Russell on the shoulder! Some say Ketch had been deliberately vindictive, others that he was blind drunk. Perhaps he was both. five Chopps … so incens’d the people, that had he not ben guarded & got away they would have torne him to pieces. A year later, Ketch himself was dead. But his fame was well established in his own time. Poems, ballads, pamphlets, broadsheets, essays abounded, all laced with hefty dollops of black humour, irony and sarcasm. Within a generation he was resurrected, reinvented as the hangman in Punch and Judy shows, the one whom Mr Punch tricks into hanging himself.